Many of the gods and goddesses to appear in Greek mythology were the personifications of natural events. One such personification was the god Boreas, the Greek god of winter, and the god of the North Wind. ​In Greek mythology, Boreas was generally considered to be one of the many sons of Astraeus, the Titan god of the stars and planets, and Eos, the Titan goddess of the dawn. Astraeus was considered to be the father of two sets of sons, the five Astra Planeta (the Wandering Stars), and the four Anemoi (the Winds); hence Boreas was one of the Wind Gods. Boreas was thus the north wind, Zephyrus was the west wind, Notus was the south wind, and the less often mentioned Eurus was the east wind. Boreas would be commonly depicted as a winged man, with wings and a purple cape; his hair though would be covered in icicles, for Boreas, in Greek mythology, was the bringer of winter, for where he went he brought the cold mountain air of Thrace. Often though, Boreas was also depicted in the form of a horse, as were all the Anemoi, travelling ahead of the wind. In the oldest stories Boreas would reside in Thrace, the area Ancient Greeks regarded as encompassing the lands north of Thessaly. Here, Boreas resided either inside a mountain cave, or in a magnificent palace; the home of Boreas being said by some to be upon the Haemus Mons (the Balkan Mountains). Later mythology would see Boreas, and his brothers, residing upon the island Aeolia, although this is most likely to do with confusion between the Anemoi, and the storm winds, who were the offspring of Typhon. It was though, Thrace that was the destination when Boreas decided to abduct Orithyia. Orithyia was an Athenian princess, the daughter of King Erechtheus, Boreas was very much taken by the beauty of Orithyia, but spurned the advances of the wind god. Not put off by the rejection, Boreas espied the princess wandering too far from her attendants by the River Ilissus, Boreas flew away with her. Oreithyia would become the immortal wife of Boreas, and gave birth to four children for the Greek wind god; sons, Zetes and Calais, and daughters, Chione and Cleopatra. Zetes and Calais would find their own fame in Greek mythology, for the pair, often referred to as the Boreads, would be crew members on-board the Argo. The daughters of Boreas were also often referred to ancient tales, as Chione was the goddess of snow, and Cleopatra was named as a wife of Phineus. 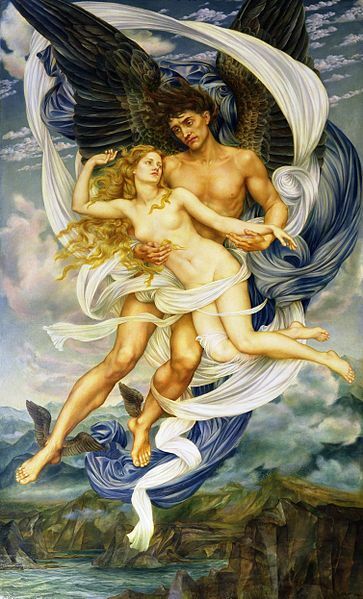 Other occasionally named children of Boreas also include the Aurai, the breezes, although these nymphs were normally classed as daughters of Oceanus; Butes and Lycurgus, brothers made insane by Dionysus, and also the hubristic King Haemus of Thrace. The offspring of Boreas were not always male or female figures, and the wind god was said to have sired many different horses. On the Troad, Boreas flew over some of the horses of King Erichthonius, and subsequently 12 immortal horses were born. These horses were famed for their swiftness, and could cross a field of wheat without breaking the ears of wheat. ​These immortal horses would be passed down through the family line, until they were in the possession of King Laomedon of Troy. These, or the horses that were paid after the abduction of Ganymede, were subsequently claimed by Heracles for work done. Other equine offspring of Boreas included the four horses of Ares (Hippoi Areioi) born to one of the Erinyes. These four horses were named as Aithon, Phlogios, Konabos and Phobos, and pulled the god’s chariot. The two immortal horses of Erechtheus, Xanthos and Podarces, were also thought of as children of Boreas, born to one of the Harpies. These two horses were given to the king by Boreas as compensation for the abduction of the king’s daughter. Boreas is often talked of in connection with Hyperborea, the land beyond Boreas, and the Hyperboreans. In Greek mythology, Hyperborea was a paradise state, the ancient Greek equivalent of Shangri La, where the sun always shone, where people lived to a 1000 years of age, and happiness reigned. Hyperborea was north of the realm of Boreas, and so the cold winds of the wind god never reached the realm. The residents of Hyperborean were thought to be descendants of Boreas, and were named in many ancient texts as giants, standing at 3m in height. Surviving stories about Boreas are not widespread, although the god of the north wind does appear in the narratives of Homer; for when Achilles could not light the funeral pyre of his departed friend Patroclus, the Greek hero offered rich reward to Boreas and Zephyrus for their help. The two wind god heard the pleas of Achilles, delivered to them by Iris, and first set the funeral pyre alight, and then kept it burning for many hours. Boreas also appears in Aesop’s Fables, in the tale of the North Wind and the Sun. A contest between the wind god and the sun god Helios, to find out who was the most powerful, saw Boreas try to force the clothes off of a traveller, whilst Helios cajoled the traveller into removing his clothes be making him too hot; the persuasion of Helios being ultimately better than the force applied by Boreas. History and mythology would combine in a third famous tale of Boreas, for when the fleet of King Xerxes was anchored off Sepias, the wind blew to such an extent that 400 Persian ships were wrecked. Subsequently, the Athenians would give praise to Boreas for his intervention.